The decontamination of low level radioactive waste is performed by ion exchange using natural Zeolites at the Idaho National Engineering Laboratory and Oak Ridge National Laboratory in Tennessee. A low level radioactive wastewater, from irradiated fuel storage basin is passed through four Clinoptilolite Zeolite columns in parallel; each column consists of two drums connected in series. When radioactive nuclides reach the bottom drums, the top drums are replaced, removed from use, sealed, and buried as a solid waste (Pansini 1996). The Fukushima disaster is only the second nuclear disaster (the first was Chernobyl) to receive a 7 on the International Nuclear Event Scale (INES), the highest disaster rating a nuclear event can be rated. The cleanup process will test new technological developments as well as tried and true methods during the cleanup of radioactive waste. One method that’s currently being used, and was used in the past, is using Zeolites. Shortly after the disaster, the Japanese government began to order the dropping of Zeolites in the oceans surrounding the disaster site. The Japanese government is hoping that Zeolites will help to slow down radioactive contamination of the ocean. Experts expect the Fukushima disaster clean up to last decades. As the cleanup continues adsorption technology will continue to play an important role in cleaning up the oceans, environment, and reducing the amount of damage that will be done to our atmosphere (Green). Clinoptilolite Zeolite had a variety of roles in tackling the dramatic detrimental effects of the Chernobyl accident. Over 500,000 tons of Clinoptilolite Zeolite was shipped in from Ukraine, Georgia, and Russia. The material was successfully used to decontaminate low-level radiation waters. The cesium concentration was reduced by a factor of 1000. The addition of Zeolite to the soil was another effort the crew established in order to reduce the supply of radionuclides to plants by a factor of 2-3 times for cesium and by 50-70 percent for strontium (Chelishchev 1995). Radioactive Cesium from the 1986 incident has unexpectedly remained in a bio-available form in upland, sheep-grazing soils of Great Britain. As a remedial measure, Clinoptilolite was tested in a greenhouse pot experiment for its effectiveness in selectively taking up Cs from Ryegrass and upland peat. The Rye-grass grown in 10% by weight mixture of soil resulted in grass leaf tissue Cs concentrations below 30 mg Cs/kg in grass leaf tissue. When no Clinoptilolite was added, Cs in leaf-tissue resulted in 1860 mg/kg. In the peat there was a difference in Cs levels of 40 mg/kg with Zeolite and 150 mg/kg without (Campbell and Davies 1997). Extensive use of natural Zeolites for reducing environmental impact of major accidents, such as the 1979 event in Pennsylvania, has led to further use for natural Zeolites due to their affinity to both Strontium and Cesium. The concentration of these two nuclides in effluent water could be effectively reduced by providing an aging period of several hours before passing such water to a polishing Zeolite bed. During the aging time, a large part of the radioactive nuclides sorbed on colloids suspended in the water were found to enter in the water and become available for removal by ion-exchange. Zeolite makes an excellent overall absorbent; the advantage to Zeolite over other absorbents is its ability to absorb/adsorb and bind with the elements that make up hydrocarbons and radioactive isotopes. Companies that have decided to be proactive on the front of water leaching and remediation can turn Zeolite into a useful tool in various cleanup sites. The type of cleanup Ida-Ore Zeolite can play an important role in is during remediation of drilling mud on the ground or in a pit. 4-14 mesh Zeolite can be mixed in with contaminated soils to bind with the oils and radioactive material left in the soils. This mesh size will allow for vehicles to drive over the top of solidified abandoned sites. Duke University released a study on wastewater disposal in October of 2013. The study focused on Pennsylvania oil and gas wastewater that had been treated at a brine treatment facility and discharged to a local stream. The study examined the water quality and isotopic compositions of discharged effluents, surface waters, and stream sediments associated with a treatment facility site. The isotopic compositions of the effluents were traced back to a local Shale deposit. Although radium levels were reduced by 90% compared to untreated effluent, and testing on radium levels at the discharge site were well below the limit of 2.2 Bq/L the levels found in the soil at the point of discharge were 200% greater than upstream of the facility. The scientists found amounts of 544-8759 Bq/kg in the discharge area. The amount exceeded the threshold for radioactive waste disposal regulations, posing environmental risks of radium bioaccumulation in localized areas of wastewater disposal. (Warner and Vengosh 2013). Ida Ore Zeolite can be very beneficial in the cleanup of solids in holding ponds. Consequentially, the data showed that in spite of significant reduction in Ra activities in the discharge water, the treated effluent has a significant impact on the sediments in the creek because Ra has apparently adsorbed and accumulated on the sediments locally at the discharge site. When oil, water, or natural gas is extracted from the ground, radioactive isotopes found in the geology naturally attach to the materials that are passing through those layers. So, water, oil, and natural gas become impacted by the naturally occurring radioactive material (NORM). Once the sought after material is above ground, it is processed, refined, and filtered – this typically results in the naturally occurring radioactive material becoming bio-accumulated, which causes a buildup of radioactive materials. As a result of the processes, you end up with TENORM. Current disposal for “special waste” above 5 pCi needs to be done outside the borders of North Dakota. Waste such as high level tailings, pipe scale, or filter socks are a growing concern for workers and residents. Most often, these are being shipped out of state to either Montana or Idaho, which have The use of Zeolite in either the transportation or storage of these NORMs will lower risk levels for highway accidents, flooding, and landfill liner failure. Zeolite has the ability to be pre-mixed into other stabilization products such as wood pellets or mixed over the top of pellets or sawdust, fly ash, kiln dust, recycled cardboard, and any other absorption materials. Heavy metals are another concern similar to NORM. Zeolite’s affinity to heavy metals was researched in an acid mine drainage facility. Nickel, copper, mercury, and silver, chromium, and cadmium were removed from water by direct addition of Zeolite powder (Semmens and Martin 1988). The affinity to the metals was so high, just mixing into the liquid solution was enough to capture the metals. Natural Zeolites have superior selectivity for certain radionuclides compared with organoresins. Zeolites are also a better value and are much more resistant to nuclear degradation. 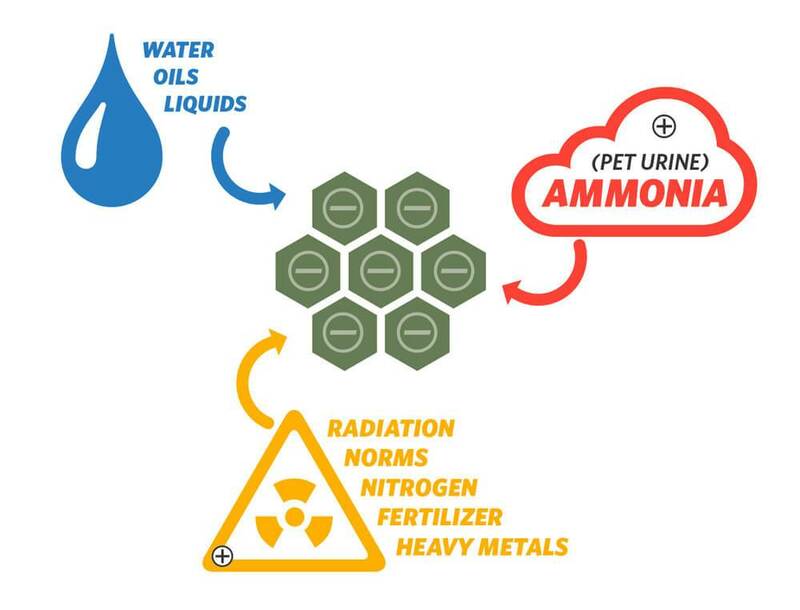 The decontamination of radioactive waste solutions is mainly based on the use of Zeolite as a cation exchanger. The well-known and highly selective ion exchange capabilities allows for removal of contaminant even when they are just present as traces, as in low-level liquid waste (Dyer 1993). A Duke University Study released on October 2, 2013 goes into detail of radiation levels in a Western Pennsylvania River upstream, downstream, and near the effluent discharge of the treatment facility. The study examined water quality and isotopic composition of discharged effluents, surface waters, and stream sediments associated with the Josephine Brine Treatment Facility. As more research is being done on the impacts of hydraulic fracturing, the issue is becoming more of a public matter. The chart shows the differences in radiation levels on both sides of the discharge point at the facility. Keep in mind, this effluent has been properly treated for current standards of radiation levels. Although the fracturing waste was treated at a facility, and levels were significantly decreased, over time the buildup of radiation reached a level outside accepted NORMs. Each radioactive site has a unique signature similar to a fingerprint, allowing the radiation to be easily traced back to the original source. Zeolite has affinity and adsorption capabilities to radionuclides: Sr-90, Cs-137, Co-60 Ca-45, and Cr-51. The presence of NORM contaminated soils at active and abandoned oil fields are not uncommon. Some states regulate NORMs while the federal government is currently deciding on how to regulate the issue. The primary decision regulating aspects of NORMs is soil concentration guidelines for radium (Spitz and Becker 1997). Conclusion of Spitz and Becker’s work states that NORM contamination is migrating from where it was spread on the ground and from other individual points of contamination. Measurements show that the NORM is moving downgrade toward a creek at the bottom of the slope and it is unknown if the radium is being solubilized and entering the groundwater or being taken up by plant life (57). The selectivity for CS and SR by Zeolites permit treatment of land with NORMS above permitted levels of 5 picocuries of total radium per gram. In North Dakota, 5 pCi of NORMs is the limit for what may be disposed of, or diluted and released for unrestricted use. In other states, that level is much higher. In reality as most people in the industry know, if a geiger counter is taken to numerous everyday objects, it will alert for radiation, but these are the regulations that must be followed. The addition of Clinoptilolite to soils for remediation of abandoned drill sites and tailings markedly reduced the strontium and arsenic uptake by plants, in turn reducing radiation levels that are transmitted to local wildlife and animals. Zeolite will release lower affinity elements such as water to take in higher affinity compounds and radionuclides such as Arsenic, Lead, Silver, Zinc, Cobalt, Manganese, Aluminum, Magnesium, Copper, Molybdenum, Cadmium, Iron, Chromium, Mercury, Thorium, Uranium, Strontium, and Cesium. In general, 40 minutes of adsorption time corresponds with 80 percent of total removal (Motsi 2009). Zeolite was widely used in the meltdown of Chernobyl. A study done by Dr. Motsi at the University of Birmingham discussed tailings accumulated with drilling often have NORM levels above acceptable rates for landfill disposal. Dilution with the use of ion-exchange has been firmly established as a unit operation in the mining industry and is firmly established as a unit operation in the mining industry and an extremely valuable supplement to other procedures such as filtration, distillation, and adsorption (Motsi). It is used in a wide range of applications from the recovery of metals from industrial wastes to the separation of gas mixtures and from catalysis of organic reactions of decontamination of cooling water of nuclear reactors. However, so far the most important application is the purification and demineralization of water. Ion exchange material is capable of removing base metals like zinc and copper (McGinness 1999) and also raise pH levels by adsorbing H+ ions (Erdem et al., 2004). The possibilities exist to recover radionuclides captured in the Zeolites structure and used as sources of heat and radiation (Mimura et al. 1994). A Zeolite ion-exchange process was developed and used on the Hanford Atomic Energy Project for the separation of radioactive cesium from highly radioactive liquid wastes (Mercer and Ames 1976). The waste had developed high cesium content from filtering liquid waste and a system was developed to back-exchange the cesium for re-use. Bio-Accumulation occurs when radio-nuclides have been and continue to be released to the environment. Once released, they circulate through the biosphere, ending up in drinking water, vegetables, grass, animals, meat, etc. The higher an animal eats on the food chain, the higher the concentration of radio-nuclides, this is bioaccumulation (Folkers).